The new “Digital Orbit” from business information provider IHS Markit (Nasdaq: INFO) reveals the readiness and global business impact of the following six transformative technologies: video everywhere, the internet of things (IoT), artificial intelligence (AI), 5G, blockchain and the cloud. A survey done in conjunction with this publication revealed nearly all (87 percent) of companies are adopting at least one transformative technology in their businesses, however just 26 percent of those surveyed believe appropriate business models are in place to to capture full value from these technologies. “Despite considerable momentum, challenges still remain and the pace of adoption of these technologies will vary considerably,” said Joshua Builta, senior principal analyst, IHS Markit. AI, cloud and virtualization and IoT – bolstered by technical maturity and wide range of established use cases – were the three transformative technologies most ready for adoption by industries today. At the other end of the spectrum were blockchain and 5G, which were assessed as far less ready for widescale adoption at this time. 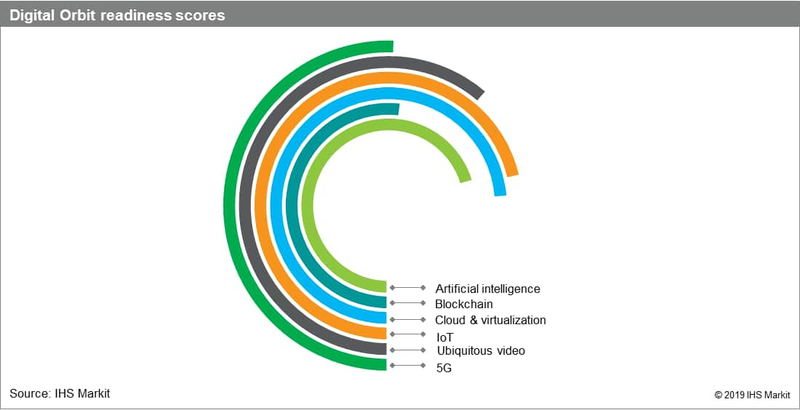 Cloud and virtualization, IoT, blockchain and 5G will all follow closely behind in the Digital Orbit impact assessment. Video came in at the other end of the spectrum. It was rated as having the least impact, compared to the other technologies examined by IHS Markit.